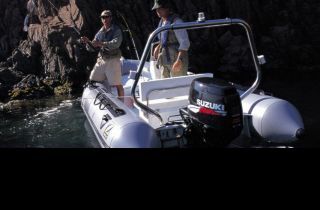 The award winning Suzuki 40 and 50hp 4-stroke outboards deliver outstanding power, excellent fuel economy, low vibration and noise - whilst meeting the world's toughest emissions requirement CARB 2008. These lightweight aluminium 815cc, 12 valve, double overhead camshaft motors with multi point sequential electronic fuel injection have been developed from Suzuki's high performance, durable automotive engines. The 40/50 are fitted with an integral timing chain which is maintenance free and enables the size of the engine package to be reduced considerably. Other features include the latest direct ignition system with integral spark plug caps/ignition coils reducing the number of parts and simplifying wiring. An intake manifold which incorporates a high capacity surge tank reduces noise and emission output across the entire power range whilst a silencer on the throttle body reduces engine noise at top speed even further.